Once you've purchased your ticket, if you wish to modify your seat or the departure date you can make changes to your ticket clicking here. If you wish to cancel your ticket, you can do it by clicking here. Please take into consideration that these arrangements may involve certain costs depending on, the general conditions of the tickets purchase. 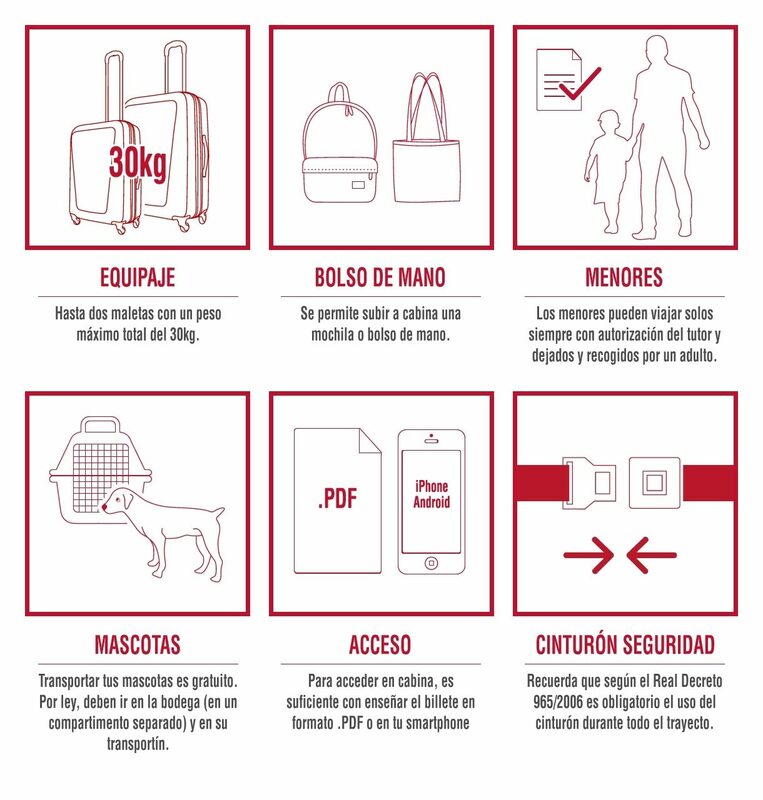 Before travelling with Socibus,check your rights and obligations as a passenger and take into consideration the following luggage limitations, accompanied minors, pets, etc. In the case of the transport of musical instruments they have to go in the trunk of the bus exempting the transport company from any damage or deterioration that they may suffer. If you wish to travel with us and have any mobility problems, we will prepare the coach for you. We have two seats accesible for peolpe with reduced mobility available in all of our coaches. Please, contact us with enough time (at least 48 h) to prepare the coach for you. If you've lost any items in one of our coaches, don't hesitate to contact us. Please contact us to check about your lost items. Socibus counts with one of the most modern fleets in the market, when it comfort for its clients and also safety, environmental conscience and accesibility in every vehicle. Every vehicle is renewed every four years maximum, and they are gifted with the most advanced elements in comfort and safety. CCTV in the outside and inside of the luggage compartment. Reclining seats with folding side and central armrests. Raised ramp and two reserved spaces for people with reduced mobility. Great comfort and space for the travellers thanks to the distribution of the seats in rows of two plus a seat. Multimedia entertainment system with touch screen and free earphones. Last generation seats, with plugs to charge and connect all types of mobile devices and USB ports. Wide toilet equipped with modern accessories of great functionality. More safety in luggage control, with four CCTV cameras. Vehicles that are perfectly adapted to people with reduced mobility. Desfibrillator in each vehicle for medical emergency situations. Information updated 20th May, 2018.